4 Bedroom Flat For Sale in East Sussex for Asking Price £1,200,000. 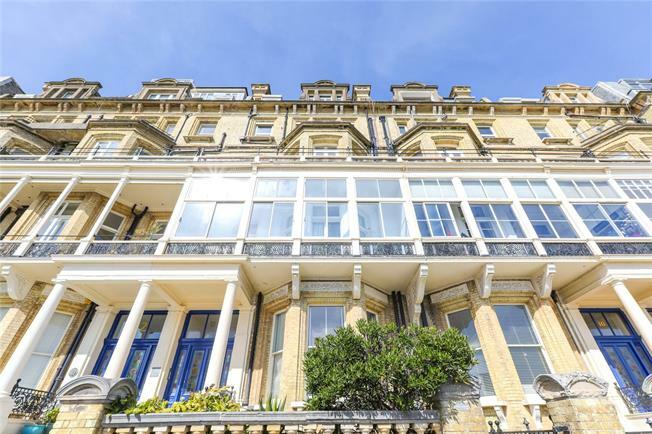 WATERSIDE - With almost 3,000 sq ft of accommodation over two floors, this really is that rarest of things, an impressively large seafront mansion apartment spanning the width of two houses, whilst also running front to the back. A wide balcony in excess of 50ft extends across the entire frontage, affording far reaching, direct sea views. The balcony is accessed from the front rooms through French windows. This is the first time this property is being offered to the market after being owned by the same family for 45 years. The flat is vast and wonderfully light, with an abundance of elegant, period character, such as marble fireplaces, ceiling mouldings and tall sash windows. Currently configured as 4-5 bedrooms, 4 bath/shower rooms, 2 reception rooms, including front sitting room and rear drawing/dining room, separate kitchen, utility room and grand entrance hallway. The proportions and scale of the property are astonishing and really quite rare, presenting a fantastic opportunity for the buyer to procure a once in a lifetime property. The vendors intend to sell the property with the benefit of a 999 year lease and a share in the freehold.